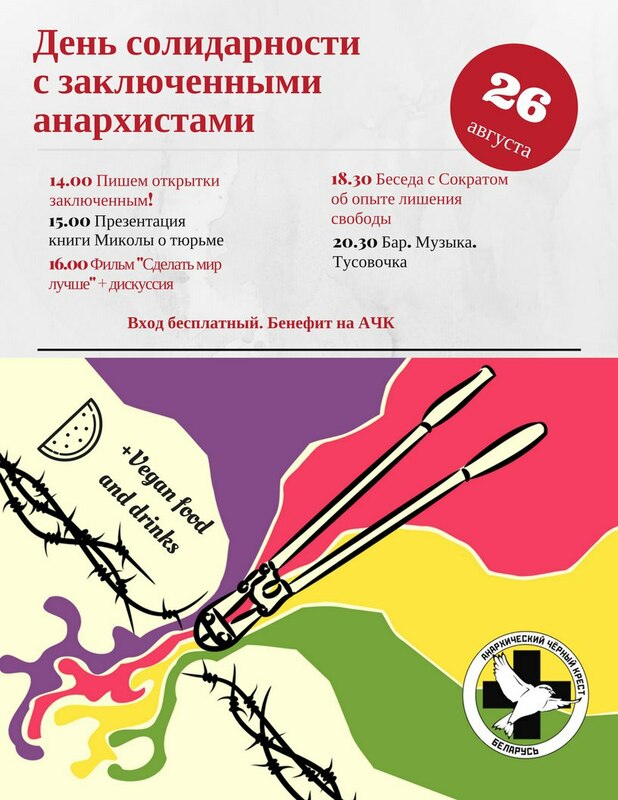 Last Saturday Minsk has joined the International Week of Solidarity with anarchist prisoners– a marathon of actions and events happening around the world from 23 to 30 August. Yesterday we were remembering not only Belarusian anarchist prisoners but also comrades from around the world, that are serving their time behind the bars of the repressive system. The event took half a day and started with reading about anarchist prisoners in different countries, the quotes of those anarchists and their thoughts. This way our imprisoned friends were not any more unknown people from far away countries – their feelings and thoughts became closer to us. 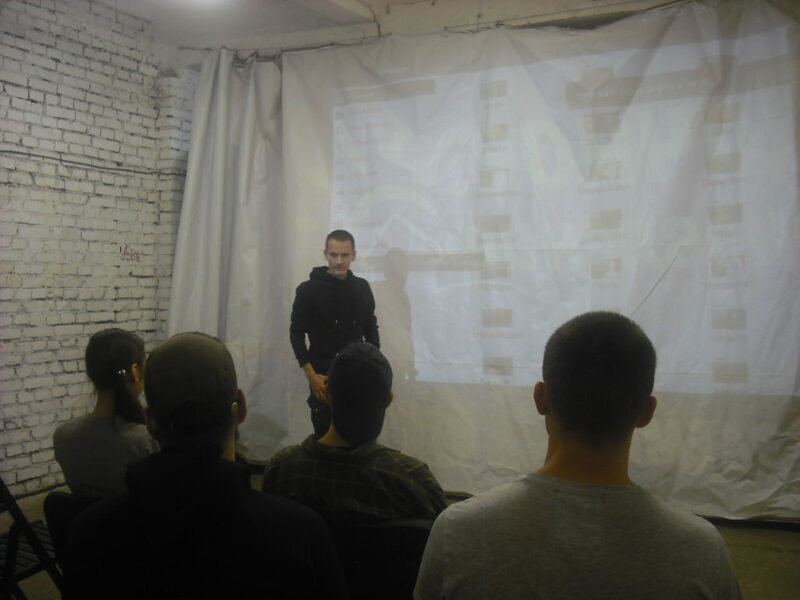 After a short break, anarchist and former prisoner Mikola Dziadok presented his book “Colors of the parallel world”– collection of essays, that author calls “prison analytics”: in each text there is analysis of one of the sides of prison life with its control methods, applied by the system. 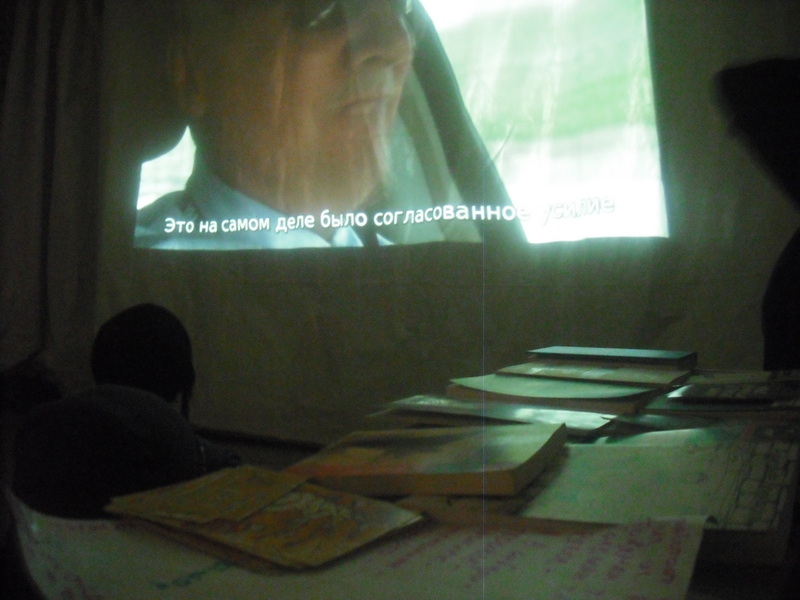 Later that day movie “Make the world a better place” was screened – first time with russian subtitles. The documentary was talking about provocation of FBI agents against 2 young anarchists, that were encouraged to use Molotov cocktails by police informers. 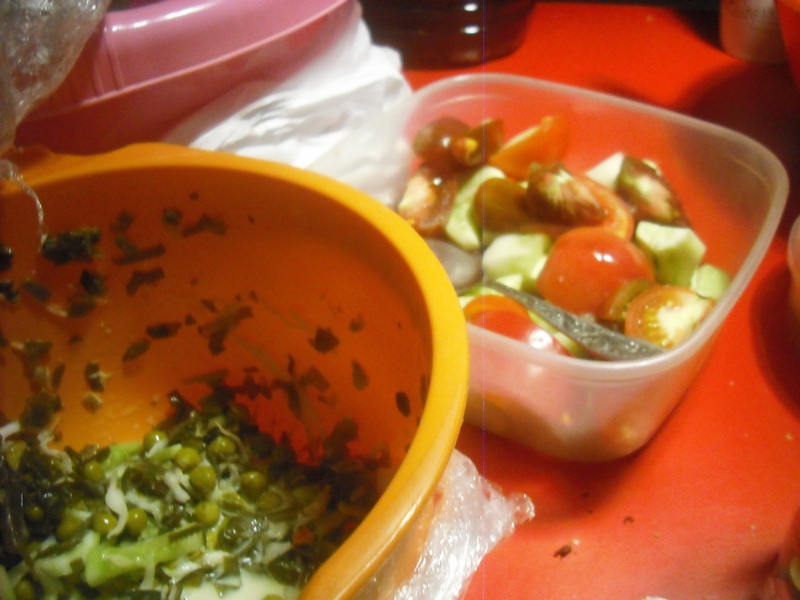 After that, they were arrested and got serious charges as if they were terrorists. The native is built around interviews with prisoners and the informer as well as materials of the criminal case, that depict a sophisticated attempt to make activists look like arson-terrorists. After the movie, there was a discussion about actually of this problem in Belarus. 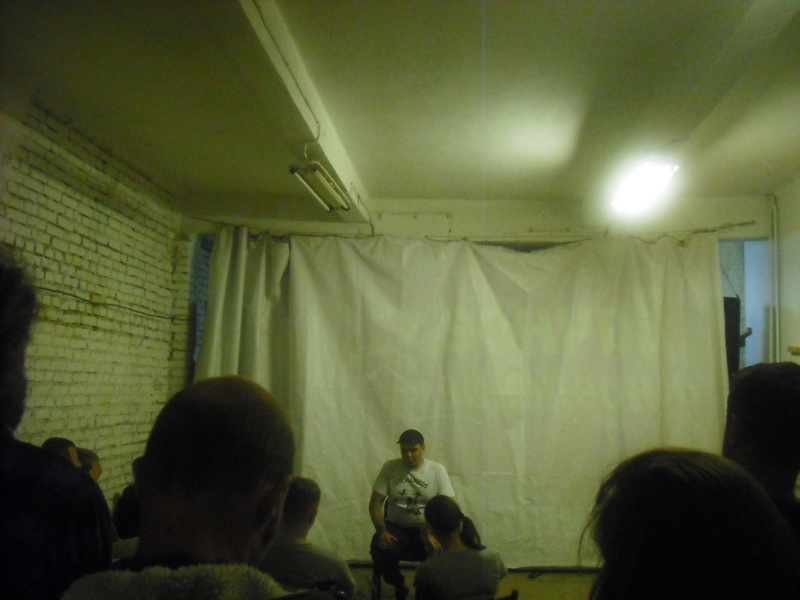 The day was ended by the presentation of Russian anarchist Alexei Sutuga (Sokrat) about his years in prison. Alexey was arrested in 2014 for a fight with a neo-nazi. With direct involvement of center of fight against extremism he was sentenced to 3 years and 1 months of prison – he was released in April this year. 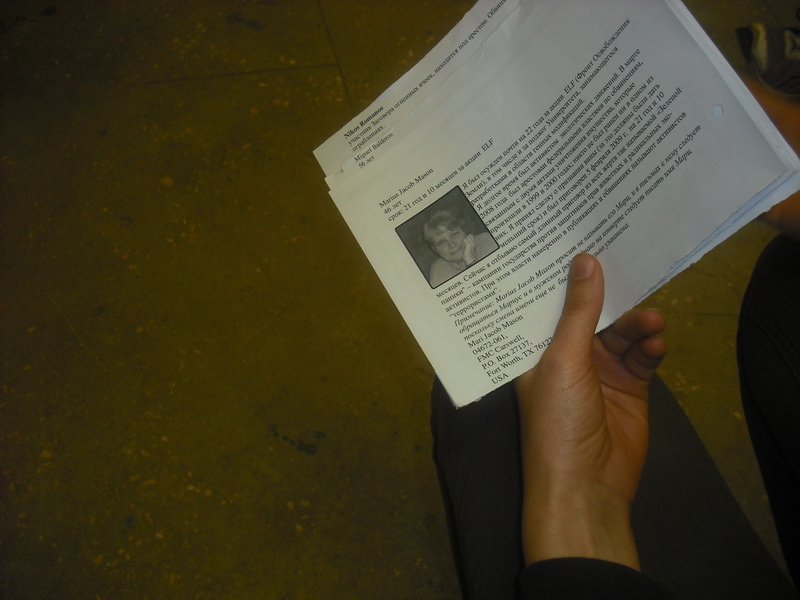 After the talk, all the people could ask questions – during that part a lot of time was spent comparing Russian and Belarusian prison systems. 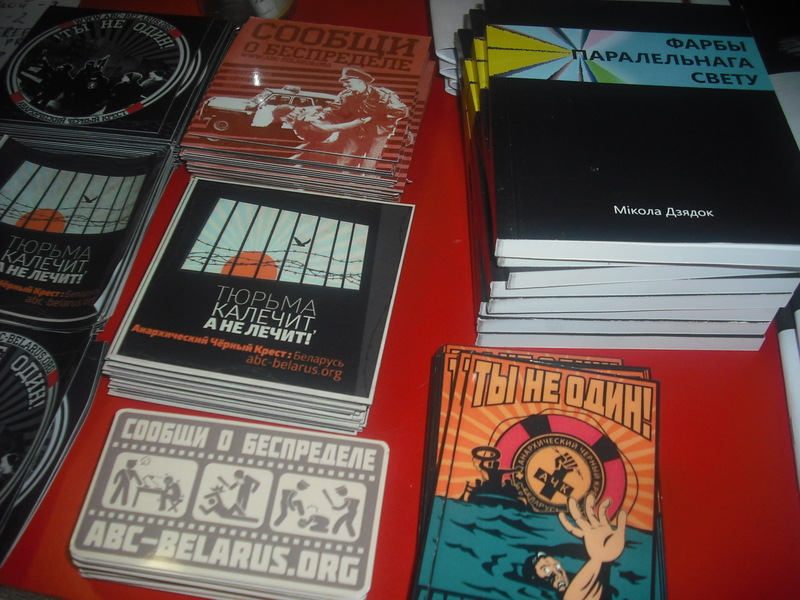 During the whole event, people could buy and sign postcards for anarchist prisoners in Belarus and other countries. 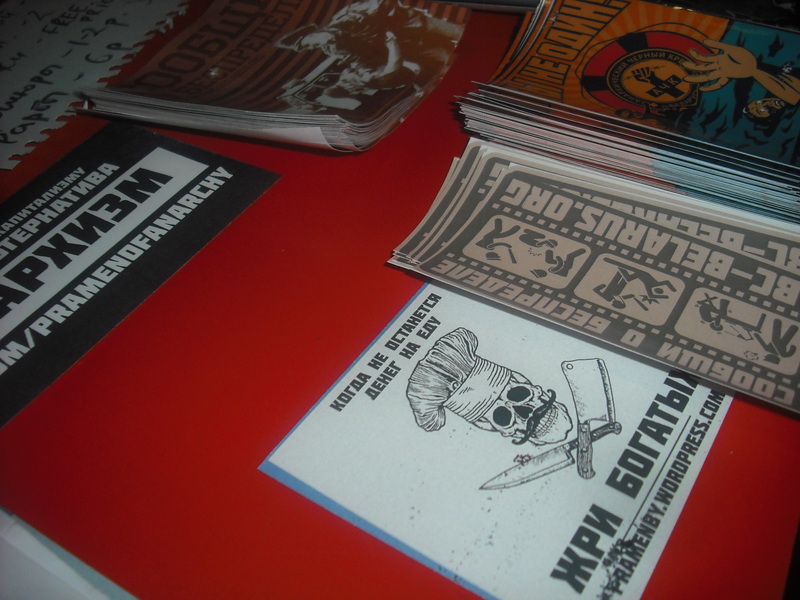 There were tables with a lot of anarchist literature. Although the event was invitation only there were more than 50 people visiting it during the day. 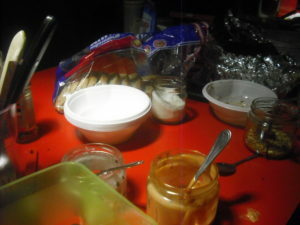 At the bar there was vegan food for donations that everybody could deal with their hunger. And after Sokrats presentation people were hanging out in informal atmosphere. You can still support Belarusian anarchist prisoners by donating to ABC-Belarus (https://abc-belarus.org/?page_id=3670 ) or writing to one of the prisoners online (https://abc-belarus.org/?page_id=3670 ). It is also important to remember that the best solidarity with the anarchist prisoners in all times was an active continuation of their struggle.